Full luggage rail 'Explorer' roof rack for mounting to the rain gutter. The luggage rails extends around all 4 sides of the roof rack, i.e. there are no open sides. Affixes to the vehicle with a system of detachable roof cross rails to the rainwater gutters. Available in two sizes: 2.0m x 1.4m or 2.8m x 1.4m. The 2.0m roof rack has 3 roof cross rails as standard and can accommodate 2 additional roof cross rails. The 2.8m roof rack has 4 roof cross rails as standard and can accommodate 3 additional roof cross rails. Also available as a short luggage rail version (for side loaded tents) or a long luggage rail version. Also available as a roll cage mount version. 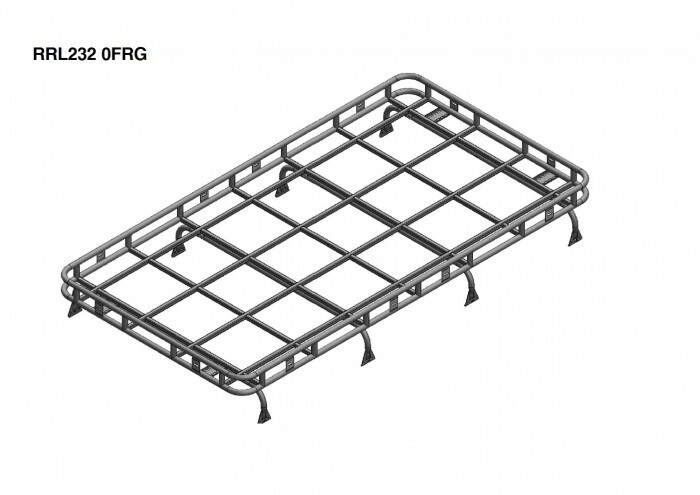 RRL229 0FRG - 2.0m x 1.4m 'Explorer' roof rack with full luggage rail for mounting to rain gutter. RRL232 0FRG - 2.8m x 1.4m 'Explorer' roof rack with full luggage rail for mounting to rain gutter. RRL229 0FL - Birch ply floor for 2.0m x 1.4m roof rack. RRL232 0FL - Birch ply floor for 2.8m x 1.4m roof rack. RRL233 6SSS - Ladder which mounts to the rain gutter and chassis cross member. Weight approx 6.2kgs. 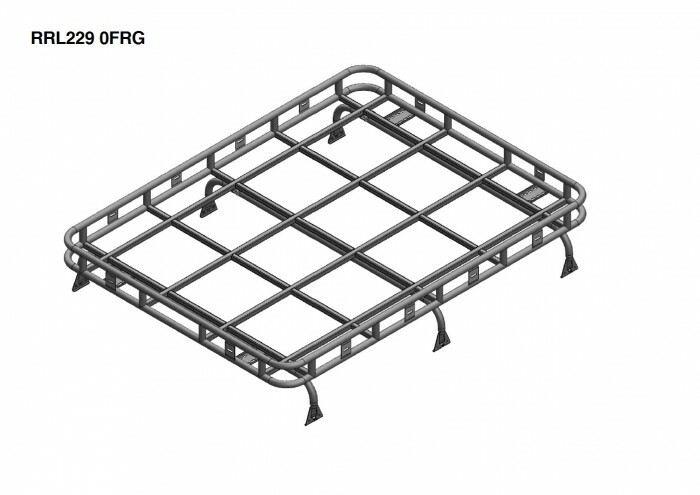 RRL239-RR-RG-XR - Additional roof cross rail to spread additional load on the roof rack. Also available to purchase for use without a roof rack for use as, for example, a roof bar, basic tent support, or attaching a roof storage box. Heavy duty steel roof rack, grit blasted, primed with a zinc enriched powder undercoat, and finished with a durable black powder coat. Roof rack can be converted in to a roll cage mounted roof rack with the appropriate fitting kit. Standard pack includes a steel roof rack, fixing bolts and detachable roof cross rails. Does not allow a sunroof to be opened.